Not long as in, long hair. Long as in IT TOOK TWO FREAKING HOURS. I have had a short hair style for about 3/4 of this year. It's like an inverted bob, short in the back, about down to my jaw in the front. With layers and texturing and stuff. It's a bit more complicated than a straight, blunt trim. But not some crazy difficult style either. Our local community college has a cosmetology school located right here in our town. Haircuts, regardless of style, length or whathaveyou, are only $8. My family has been getting our haircuts there for years. They are pretty awesome. You get a cheap haircut because you let students play with your hair. But never fear, there are teachers overseeing everything; the student talks with a teacher about how they plan to cut your hair before starting, and a teacher checks their work when they're finished. I have never come out looking like a monster. In fact, my daughter went IN looking quite ridiculous after taking scissors to her own hair, and came out looking much better. However, I have also never had a haircut take two whole hours! Students do cut your hair slower than someone who has more experience. So you have to go into the school knowing it will take a bit longer. Not that much longer, though. Seriously, it was awful. The girl they had do my hair was obviously brand spankin' new. Not only that, she seemed to naturally move in slow motion. She walked me back to her station slowly, back to the wash sinks slowly. Everything....slowly. So I shouldn't have been surprised by how long cutting my hair took, right? Well I'm sorry, I was utterly beside myself! I kid you not, I wanted to say something to her so badly, but I'm a huge chicken about that sort of thing. Inside I was all, "Get this effing haircut done and let me get the hell out of here!" It took so long I got really anxious thinking I just might HAVE to say something to her face about it. Mark got a haircut at the same time. His stylist was done way before mine, so he sat and watched. He told me she looked scared. 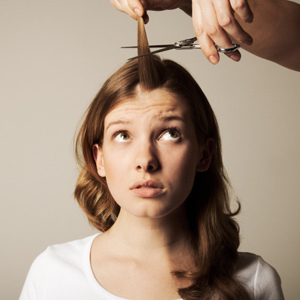 He said she would hover over my head with her scissors poised to make a cut, but take several moments to follow through. He was sitting there silently cheering her on, "Make the cut! You can do it!" He also said the instructor gave him a few looks of apology. I sat in her chair and nearly fell asleep. At first I didn't care. Going to get my haircut is a fantastic excuse to sit and relax. But once I realized just how long this was taking, and that we were going to need to get home for the kids, I started getting really impatient. She had trimmed up the back, and even done some snipping in the front. I thought she must be almost done. Instead, she gets her instructor, asks him a question and he shows her a little something. Suddenly it was like she started all over. She kept snipping and snipping and snipping at the back of my head. It took everything in me to not jerk my head away and yell, "Please back away from my head. Put the scissors down. Just stop the cutting! STOP IT!!" When she moved to the front of my hair I couldn't believe it. I couldn't believe she still had more to do. At that point I realized that the two students on either side of me had each done two cuts while I was sitting there. I also noticed how chatty those other stylists were with their clients, while mine was concentrating too hard to hold a conversation.....yet still taking FOR-EV-ER. Finally I started dropping hints. I asked Mark what time it was. I mentioned the kids coming home from school. Mark pointed out how we hadn't even had lunch. I said I was so hungry I had a headache. He said he was starving to death. I let him LEAVE to get some BBQ from across the street. I wasn't worried he would take too long because this chic was clearly not done with me! Finally -- FINALLY -- she called her instructor over one more time. After two hours of working on my head, he still had to fix a couple things. He tried to hand the scissors back to her to do the fixes herself, but she asked him to just do it because I had been in her chair too long. I am really not trying to pick on the poor girl. I'm actually trying to illustrate the humor in the whole thing. On the way home Mark and I shared what was going through our heads in those two hours, and giggled....shaking our heads and giggling some more.